The Christmas prix fixe at Monsieur Ducasse’s spot in the St. Regis is a bit of a splurge, but consider it a present to yourself. Maine-lobster medallion and diver day scallops with black truffle anchor the menu, and dessert is a liqueur-infused trifle called Chocolate Comosition. At the seafood-centric spot in the W Times Square, feast on dishes like tuna carpaccio with quail eggs, or pan-seared halibut with lemon-herb gnocchi, chanterelles, and crab. Desserts include ginger-snap crème brûlée and a festive white-chocolate Yule log. The appetizers (quail with foie gras) and entrées (lobster steak, filet mignon of veal) here from chef David Burke make up one of the most luxurious Christmas menus in town. The excellent dessert list includes whimsical options like the three-part Scrooge: a “beggar’s purse” (chocolate-filled crêpe), a “Tiny Tim” chocolate cake, and a cocoa-cream shake sprinkled with gold leaf. 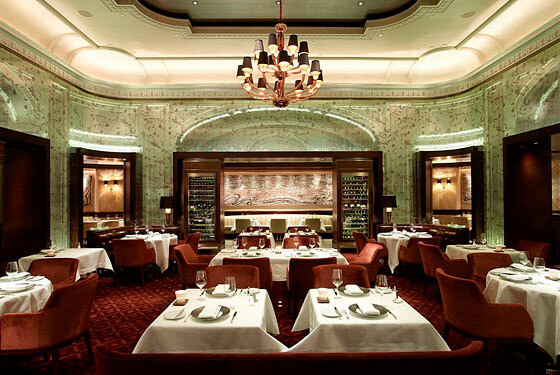 On the 25th, Gordon Ramsay’s ever-so-slightly more casual restaurant at the London features an entrée choice of slow-roasted turkey with root vegetables or a filet of Brandt beef with celeriac rémoulade and confit shallot. For dessert, there’s pumpkin panna cotta, Christmas pudding, or Valrhona chocolate fondant. With four options for each of Kerry Heffernan’s three courses, everyone in the family ought to be able to find something to fit their palate. While Mom and Dad dine on a côte de boeuf with horseradish crème fraîche and a tarte tatin with bacon streusel, kids can go for the roast ham with maple glaze. Catch a spectacular view of midtown while dining on a stuffed rack of venison or roasted Scottish pheasant breast at this Queens spot. For dessert, there are pumpkin profiteroles, dulce de leche, and chocolate-bread pudding.